"The ash fall at Sand Point, Idaho, more than 300 miles northeast of Mount Saint Helens. At the height of the ash fall even at this distance there was not enough daylight to properly expose film. 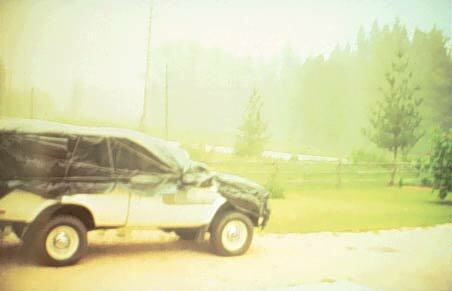 The car has been covered to protect it from the abrasive ash. Ash continued to fall several days after the eruption had subsided. It damaged or destroyed many agricultural crops downwind from the eruption. However, in the long run the ash provided beneficial nutrients to the soils." (U.S. Dept. of Commerce, 1980, p. 5) Photo: Courtesy of NGDC/NOAA.